Currently, there are hundreds of mail servers, however, and Internet users are still hungry. 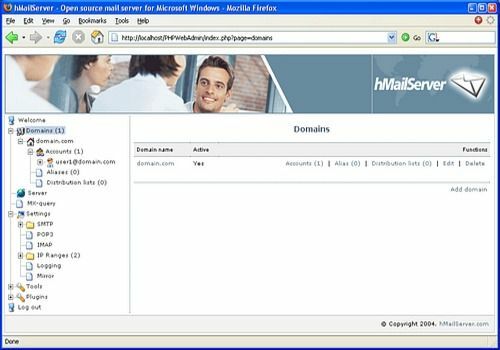 hMailServer is one of the few offers that satisfy Windows platform enthusiasts, not only because it is free, but also because it is open-source. In addition, it supports the most popular email protocols such as POP3, SMTP and IMAP. Similarly, hMailServer supports virtual domains, aliases, message verification through antivirus, antispam protection and more. For email data storage, the server uses a MySQL or MS SQL database, depending on the user's choice. Here, there is no question of having a database server installed on your machine or accessible on your network, because the default installation of hMailServer is provided with a minimal MySQL server. Automatically forward your AOL, Gmail, Hotmail, MSN, Netscape, Yahoo, POP and IMAP messages to any email address!